First Floor 1415 sq. ft.
Width 48 ft. 10 in. Depth 60 ft. 10 in. Country French styling combined with a practical floor plan makes this small and affordable European home plan an instant winner! You’ll love the gentle arches and recessed entry that give this home welcoming street appeal. 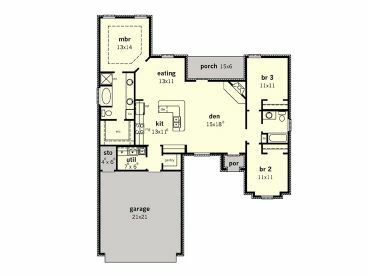 Furthermore, you’ll find the floor plan is very functional for a young and active family. The common gathering areas are arranged at the center of the home where the den/great room rests beneath a 12’ ceiling and enjoys the warmth of the corner fireplace on wintry nights. This gathering area connects with the island kitchen and casual dining area creating an open floor plan that easily handles everyday happenings and holiday get-togethers. You’ll appreciate the handy snack bar and access to the rear porch. In addition, unloading groceries is a snap as you pass by the walk-in pantry when coming in from the double garage. And multi-tasking is easy with the utility room situated just off the kitchen; prepare dinner and handle laundry chores at the same time. Your master bedroom is secluded for privacy and boasts fine appointments like a double bowl vanity, garden tub and separate shower. Don’t miss the walk-in closet! Across the split-bedroom floor plan, Bedrooms 2 and 3 share a hall bath. 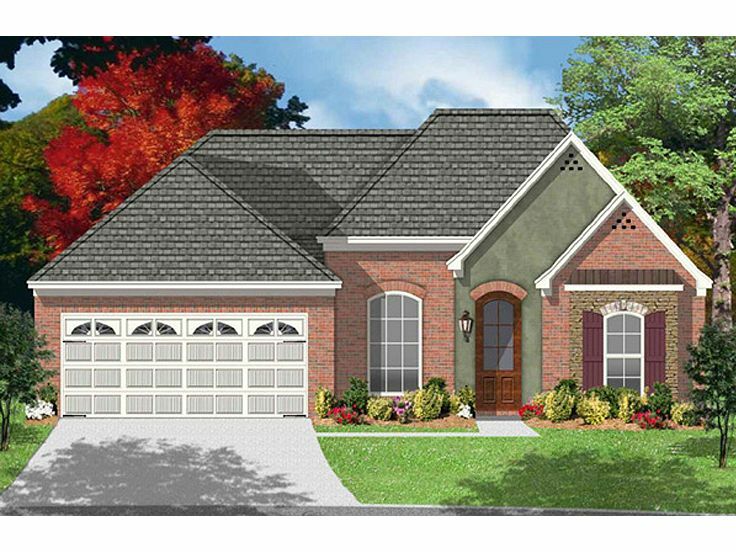 If you’re looking for a starter home that is well-suited for today’s active families, this ranch house plan can’t be beat!